The Roasted Chicken and Lemon Herbed Potatoes I made for dinner last night. The recipe was from Country Living Magazine and was soooo good! And it has fed us for two nights so far...tomorrow I will use some of the leftovers for a Mac & Cheese recipe in the same issue/article of the magazine. Time to make some ATC's tonight for a swap coming up on Thursday. Played with all sorts of Halloween papers, images and themes. A warm, comfortable, homey apartment. Autumn Leaves candle from Yankee Candle. A weekend in Maine coming up in a few weeks. My family. Past and present connections, memories and future moments to come. The television remote control. Seriously. What a pain to have to get up every five minutes to change the channel! Support I don't have to go far for. Yarn. My stash and the possibilities it holds. Always exciting to find the perfect pattern for a favorite yarn. Fall decorations....here's my fall wreath. Actually we keep the same grapevine wreath up all year and I add and take things away each season. So it isn't anything fancy...but it is fun that it is always changing. And since we live in a small apartment it saves space to have one universal wreath instead of finding places to store one for each season. Don't really know what to say today. So I'm posting an old photo of a paper sculpture I made a year or so ago. I only made two because it was much very labor intensive. I keep it on the bulletin board near my desk for inspiration. I haven't really taken any recent pictures...maybe this weekend? a wonderful birthday dinner with my family. a night in Boston with my girlfriends. sushi. cannollis from the North End. wine at an old jail turned bar. rain to water my flowers. a good childhood full of smiling, playing, imagining, love. our apartment and time together. doctors and living in an area with some of the best in the country. beach days with my mom. sitting on the porch chatting with my dad. homemade lasagna. means not having to cook dinner for days. fall in new england to look forward to. I recently finished Hey Teach and wore it. I may need to replace the buttons though. They are a little too small for the holes and the sweater keeps coming unbuttoned. But all-in-all I'm very pleased with it and it was a quick knit. Here today I'm getting ready for Earl...now a weakened Hurricane. But still might be a Cat1 when it brushes by our coasts here in Mass. Even tropical storm winds can wreak some havoc here near the water. We live up on a big hill and during a recent Nor'easter the wind was rattling our sliding glass door pretty good. 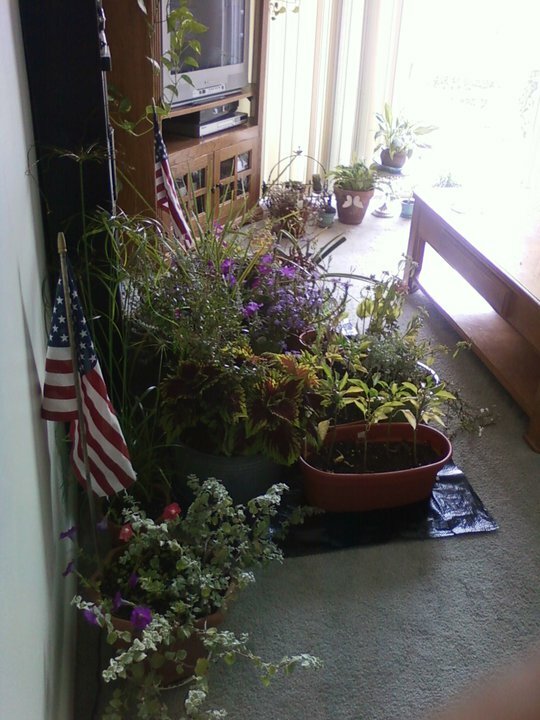 So...per order of the apartmetnt's leasing office I moved all my plants from the balcony into the living room. Good Lord. It's a jungle in here. 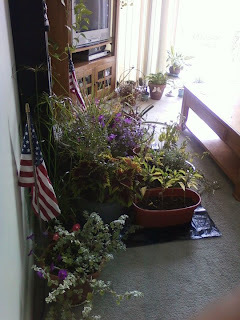 This picture isn't even all the plants. I hadn't finished yet. So its a bit crowded here.